This is the second blog in a series of blogs relating to turf care professionals. 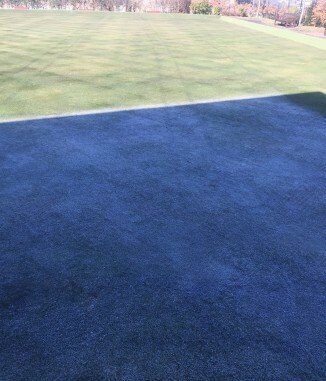 The aim of my Pro Turf Care blogs is not to set out a ‘how to’ guide. The aim is to highlight the difference between simply cutting grass, and the passion, skill, dedication and pride it takes to care for grass. When I was growing up in East Kilbride there was a bowling green in the next street from our house. I decided if I was going to talk to someone who cares for a bowling green then that green was the place to start. I drive past there in my van to this day. The thing is, I’d never actually set foot within the grounds until the day I met the green keeper. I opened the gate and gave a tentative, ‘hello’. I had no idea who I would be greeted with. ‘Yes, mate. Can I help you?’ I couldn’t believe who it was. He was someone I knew from primary and secondary school, and a family friend. His name is Michael. Amazing! I think it was a surprise for us both. Even better, it turns out he was the green keeper. Michael says this particular bowling green is unusual in that it’s a municipal managed green (the local Council take care of its maintenance) and the members’ club that play on it are part of a competition league. This is unusual because competition greens are more often than not made up of two greens. Two greens mean they can be alternated in order to keep both greens in top condition during the playing season. This municipal green is a single green. Keeping it in a condition suitable for tournaments, and up to a standard expected by the members, requires more than simply mowing. It requires, among other things, careful planning, preparation and timing. For this particular single competition green, the task is even more difficult as the size of the membership of the club is nearly twice as much as other local bowling clubs with two greens at their disposal. So what’s so difficult about caring for bowling green turf? Isn’t it just like a domestic lawn that’s cut really short? Definitely not! Michael and I chuckled about this misconception. 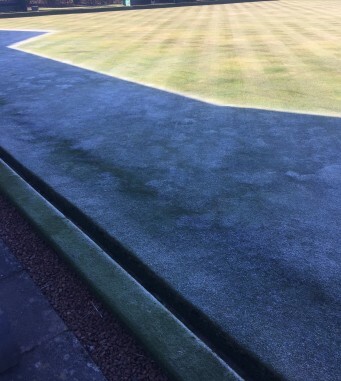 The type of grass mixture used in bowling greens are different to domestic lawns. In addition to this the soil in a bowling green is added to with a top dressing annually, and possibly twice annually. Then, of course, the soil underneath isn’t a mixture of clay and rubble like many housing estate lawns are built upon. Even the maintenance equipment that is used is very often different from that used on domestic lawns. Michael explained that his mower would jam very quickly on a domestic lawn. He is cutting off a millimetre or millimetres of grass at a time. It’s a slow process to get a bowling green looking beautiful. Michael has worked on this green for 8 years, and he said it took him about 2 years of applying his regular maintenance programme to get the surface looking the way it is today. I asked Michael if I could walk onto the green. Of course, he said. This was a big thing for me. I had never set foot on a bowling green. My first impression was one of awe. I crouched down to touch the grass. There was no way I could run my fingers through this grass. I’m pretty sure I’ve had longer stubble on my face on a Sunday morning than the length of the grass on this bowling green. Wow! This was indeed professional fine turf care. Michael smiled as he told me he has a job and a half caring for this turf. He says many bowling greens are relaid every 12 to 15 years. The green he was caring for was still the original green and was over 35 years old. That’s an awful lot of feet and bowls that have traveled along its surface. On this note Michael let me know another hurdle that bowling green green-keepers need to contend with. Most lawns, even fine turf lawns such as golf greens, are walked upon in multiple directions. With a bowling green there are playing lines. These lines create long depressions and crests in the playing surface. 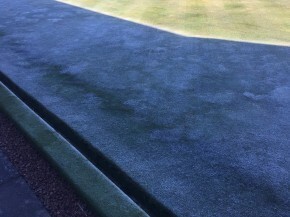 Players prefer to stick to these lines as they know how their bowls will react, and plan their game accordingly. Even when Michael moves the markers a metre or so to the right or left to rest and maintain these lines, the players often move the markers back and play along their most used and preferred lines. Caring for the grass on this well used and compacted playing surface can therefore be difficult to manage, and every year the green is top dressed with soil to even out its playing surface. A myth I enjoyed busting, with Michael’s help, was the use of weed killer treatments on grass playing surfaces. Some people assume professional playing surfaces are drenched in weed killers and fertilisers in order to keep the grass looking so green. I know, and Michael and many other lawn care professionals know, that it is hard work, dedication and pride that keeps the playing surface looking good – not fertiliser and weed killer. Michael says under no circumstances do non-selective weed killers get used within the near vicinity of the green. The green is precious and many people are relying on it. They cannot risk non-selective weed killer particles drifting onto the playing surface and killing the grass. If a selective weed killer (weed killer that kills broad leaved weeds and not grass) is used, which is rare, it is used sparingly and as a spot treatment only. Regular mowing and maintenance produces strong and healthy grass. The stronger and healthier the grass, the better equipped the grass is to compete against and deter weeds. Weeds aren’t actually Michael’s biggest problem when caring for the bowling green. His biggest problem is moss, disease, compaction (along those well traveled bowling lines) and other invasive grasses. With a regular maintenance programme (mowing, scarification, aeration), together with a balanced use of fertiliser and moss treatments, Michael is able to keep the green healthy and looking great. Shade is another concern for this green (as can bee seen in these photographs I took during my visit). Grass growing in shade can be more susceptible to moss. Thankfully by midmorning the shade is gone. I visited the green in March. March is a busy time for bowling green green-keepers. The bowling season starts in early April, and the playing surface needs to be ready for the grand opening. It’s quite an occasion. Local dignitaries are invited along, and this year the wife of the President of the bowling club will bowl the first jack along the green. I think this must be a great moment for Michael. All his hard work throughout the year and the run up to opening has paid off. The bowling club get a wonderful playing surface, and he can take pride in a job well done. However, it doesn’t stop there. Michael needs to regularly inspect the surface and keep it well maintained. Without Michael’s knowledge, experience, hard work and pride, the grass just wouldn’t make the grade as a bowling green. It was a pleasure to chat with Michael. It was good to meet and talk with him about our shared passion – lawn care. Michael has invited me back in the Summer. I’m really looking forward to my second visit to this bowling green. Thank you to Michael for his hospitality, and for sharing his experience of professional bowling green turf care with me.